Food is a necessity of life. It provides us with energy, gives us nutrients, and should be a delicious, enjoyable part of our daily lives. All people eat to survive. What people eat and how they eat, however, depends on their environment and the culture that develops about that environment. Do you know where the food you eat originates? Do you know if it is fresh and free of harmful pesticides? Do you know if it is produced without harming wildlife or the environment? Where our food comes from has changed radically with the development of transportation (trucks and airplanes) and refrigeration. Today, grapes can be flown in from Chile, oranges from Florida, and lettuce from California. Did you know that the typical food item travels 1,500 miles to your local store? Where is food grown? How many miles does it travel to your table? The food web is critical to all living things. All food chains start with the sun. The producers, or plants (on land and water) and animals, provide food for the consumers. Herbivores are consumers that eat only plants; carnivores are the consumers that eat meat. Omnivores are consumers that eat both plants and meat! The decomposers are the organisms that break down, or decompose, food. Play the food chain game. 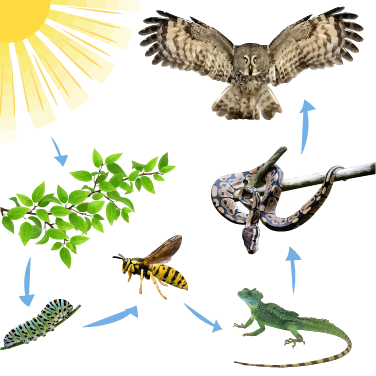 Create a food chain and a food web diagram and upload it to the gallery. 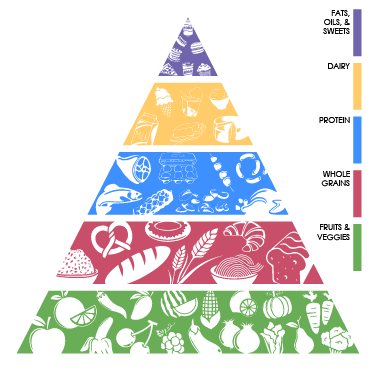 The original food triangle is a graphic guide to eating diverse food groups daily. 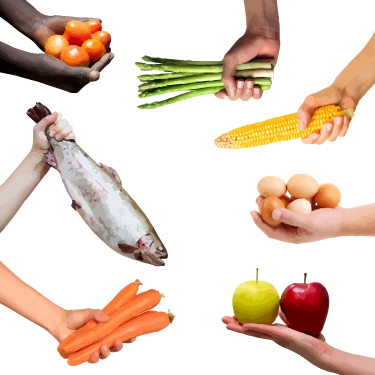 The triangle presents a balanced diet of food groups - grains, vegetables, fruits, oils, dairy products, and proteins. Grains includes breads and cereals. There are plenty of vegetables to eat- beans, cucumbers, leaf lettuces, spinach, broccoli, and more! Common fruits include oranges, grapefruits, bananas, apples, grapes, raisins,etc. Milk products include all types of milks and yogurts, butter and cheeses. Protein is found in meats, fish, legumes, lentils, and different types of beans. Based on a 2,000 calorie-a-day diet you would need to eat: Grains: 6 ounces daily, Vegetables: 2.5 cups daily, Fruits: 2 cups daily; Milk: 3 cups daily (kids 2-8, it’s 3 cups daily), Meats & Beans: 5.5 ounces daily. How many cups of food does that make? Clue: 1 cup equals 8 oz. Make steps up at least one side of your pyramid as a reminder that exercise is part of a healthy lifestyle! Create a balanced and healthy food plate! Activity 3 – are you hungry? Human beings need to eat to survive. Do you know what it feels like when you are hungry, and your stomach ‘growls’? Do you know anyone who is hungry? Have you seen homeless people begging for money or food? Research poverty in your town or city. Write a report about those that are without food and find the organizations that serve free food in your community. Food is necessary to sustain life. It also impacts our local economy and environment. Most of us do not realize that by buying imported food, we are taking away jobs from our very own communities. We are impacting our carbon footprint. As more and more farmland converts to suburban living and commerce, we lose a sense of place and community. 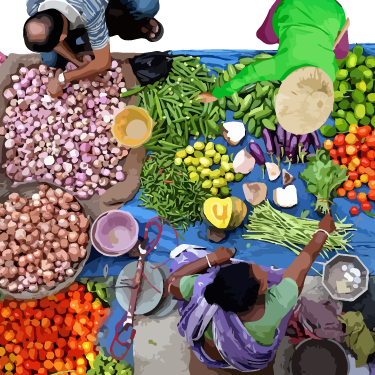 Urban areas, dependent almost on imported food also face food security if food sources are cut off or depleted. Watch Choose Canadian: Eat Real Eat Local to see the effects of importing food on local communities. 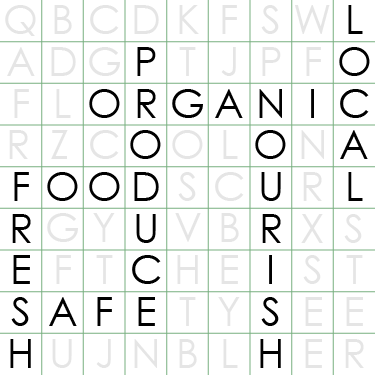 Find out where you can purchase local foods to support local economies. Better yet, look at growing your own!!! Watch Making the Case for Healthy, Freshly Prepared School Meals and see how food is connected to local economy, health, school attendance, and the environment. Record the research for these four topics in a poster for your school! Upload it to the NEXT.cc Gallery! local economy: Buying locally grown, organic foods helps support small farmers and brings commerce into your neighborhood. Visit your local farmer’s market! 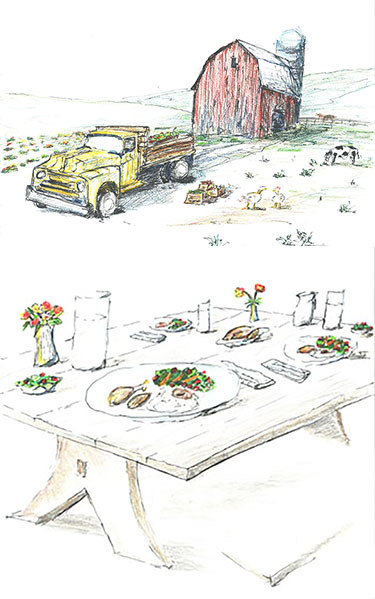 physical environment: Growing food organically keeps harmful pesticides out of our soil and water. Buying locally grown foods decreases the amount of energy needed for transport. social well-being: Share what you know with friends and family to increase social awareness of the importance of locally grown food. emotional: Feel good about making good choices for your health and the health of the environment. With food production moved from small family farms to larger, industrialized farms, food production is at an all-time high. America throws away 30-40% of the food it produces! 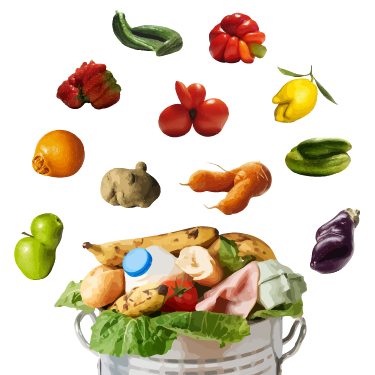 Almost six billion pounds of food are wasted every month. Where is food going? Food is thrown out by families at the average of $1500 of food per year. This waste is due to overstock and over-purchasing. Grocery stores are another culprit as the demand is for fruits and vegetables cosmetically free of blemishes, spots or wrinkles; another reason is confusion about sell-by and expiration dates. Surprisingly, food that is ugly, extra, not completely fresh, is often, for the most part, edible. What can you do about food waste? Can you repurpose food? Can you compost it and contribute it to enrich topsoil? Think of three things you can do. Snacks are the largest part of the food triangle. You should eat 3-5 servings of fruit a day. Different cultures eat different foods. Food does not travel across the ocean. All food chains begin with the sun. Hw to Feed 10 Billion people sustainable? What's the Story of Your Food?